“Mother is a singer. I live in her dark margin. Sophia Hill, 10, often spends her evenings watching her mother Naomi perform, “singing us through all our feelings”, at the Blue Angel, a Chicago nightclub, sharing her mother with the audience but waiting for “those tiny moments that are just between us”. It is the 1960s and it is a time of transformation and tension. Even more so for a young girl whose mother is far from conventional. 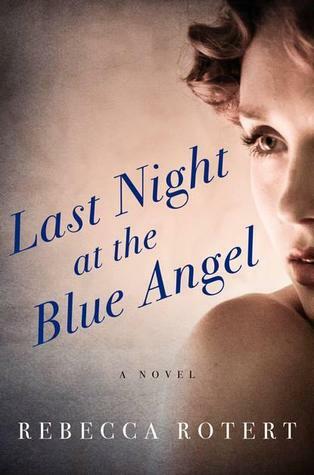 Told from the alternating perspectives of Sophia and Naomi, Last Night at the Blue Angel is a heartfelt, well-written tale of family and growing up, as well as chasing those traces of stardom. Naomi’s tale reaches back into her childhood in small town Kansas where her relationship with another girl causes her to be more or less run out of town by that girl’s family. She escapes to Kansas City and eventually finds her way onto the stage, where her voice captures and enraptures. Naomi’s struggle for fame doesn’t make life easy for her daughter who is wise beyond her years, the caretaker, the one who tends to her mother, but who is still a 10-year-old girl, teased at school, wanting a friend of her own. Then there’s Jim, a photographer who has devoted his time to the two of them, helping look after Sophia, taking photos of Naomi, hopelessly infatuated with her. It’s a moving story of love and devotion – to family, to art, to passion and to one’s own self. The soulful music of Dinah Washington and Billie Holiday playing in the background helped set the mood for my read. And it’s a book I really enjoyed reading. It might have been Naomi’s story and rise to stardom but Sophia’s voice rang pure and clear. She hasn’t had the easiest of childhoods, having to pick her mother up time and again, so it is sometimes easy to forget that she is still very young. Her fears of a nuclear fallout, her lack of friends at school, her devotion to Jim and her mother’s friends, all these little bits and pieces of Sophia’s life are pulled expertly together by Rotert to create this amazing girl, an unforgettable character. I imagined Naomi’s voice as low and a bit raspy and wondered what it would be like to listen to her sing. I kept thinking of Grace Potter although she’s more of a blues rock style. While thinking about this book and what to write about it, I recalled my own first tentative experiences with live jazz in Singapore. A jazz bar called Somerset’s was where we used to go listen to Eldee Young and his band when we were in university. Young was from Chicago but played mostly in Asia. He passed away in 2007. Young often played with Singaporean jazz pianist Jeremy Monteiro whom we also saw perform a few times, but never together. It’s odd that I don’t really listen to much jazz music – then and now – although it was something I enjoyed watching perform live. I think it was about the being together with my girlfriends, sipping a cocktail (the legal drinking age in Singapore is 18) and marveling at these people playing in front of us. It was kind of fun to reminisce about those times – they seem so very long ago now. Rebecca Rotert received an M.A. in Literature from Hollins College, where she was the recipient of the Academy of American Poets prize. Her poetry and essays have appeared in a range of magazines and journals. She’s an experienced singer and songwriter, who has performed with several bands, and a teacher with the Nebraska Writers Collective. She lives in Omaha, Nebraska. This is her first novel. Follow Rebecca on Twitter: @RebeccaRotert.